I’ve always admired period pieces, for multiple reasons. First of all, period pieces, whether they be films, video games, etc., are more difficult to craft skillfully; they require more time and effort in research to make the experience seem lifelike and genuine. A lack of research into contemporaneous elements, such as technology, clothing, and even language, takes you out of the immersion, diminishing the experience as a whole. I’m no historian, but it looks like Herald: An Interactive Period Drama performs this historical due diligence, and so much more. 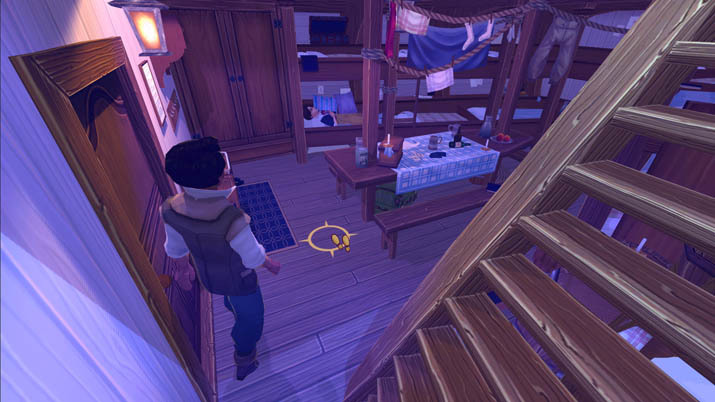 Herald is a point & click adventure game developed and published by Wispfire. Set in an alternative 19th century, Herald follows the journey of Devan Rensburg, a young man who boards a merchant ship in an attempt to return to his place of birth. While onboard the ship, the HLV Herald, you must interact with fellow crew members and passengers – how you treat them is entirely up to you. In each conversation you have with a character, you are given multiple dialogue choices of how Devan should act. For example, is it better to stand up for those oppressed by their superiors or keep to yourself and work your way up the social hierarchy? These dialogue choices add another layer of complexity to Herald and boost its replay value. The rest of Herald’s gameplay is typical for the genre. 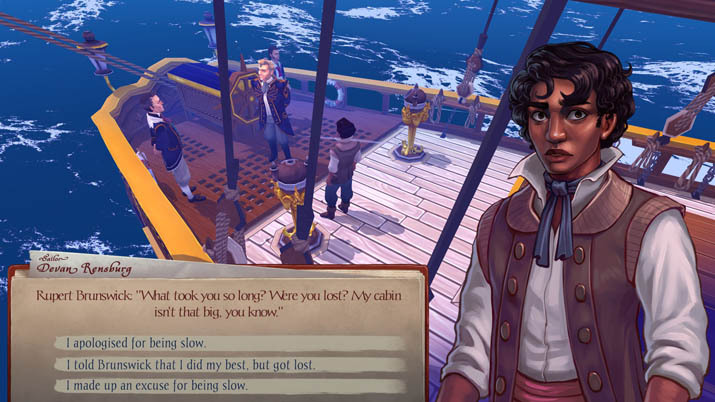 You’re able to explore the ship, collect items, and learn more about each character and their secrets. Everyone has something to hide, and it’s hard to know who to trust. Characters are the driving point of Herald. Each one has his or her own personality and dreams, and is uniquely designed, but they all are brought to life by wonderfully talented voice actors. Each voice seems to capture the essence of the character, in turn capturing you: players are invited to relish the immersive performances, and get lost in the histories of the cast. A lot of time and energy was directed into the voice acting of Herald, and it shows. Alongside Herald’s incredible voice acting is its artistic design. The game feels like you’re opening up a storybook, with bright and vibrant colors that pop out at you. Despite sometimes feeling cartoonish, the visuals still have an air of sophistication, keeping the tone serious and mature. 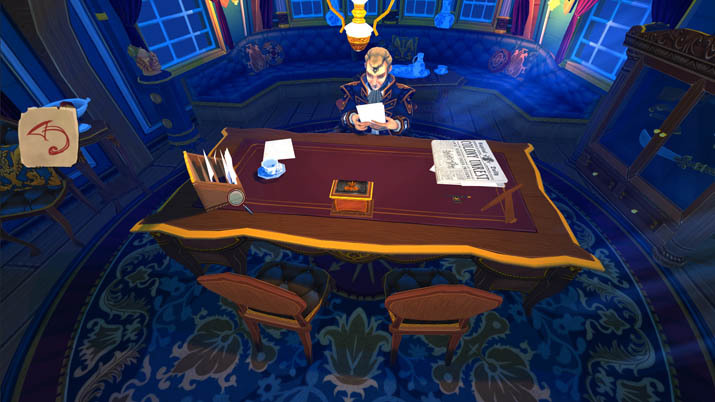 Each character’s still model appears on the right side of the screen whenever you talk to them, which further emphasizes this storybook ambiance and gives you the opportunity to study and appreciate the intricate details of their designs. Although Herald is pretty throughout, its beauty is showcased whenever there’s a sunset: the artists at Wispfire masterfully capture the picturesque clash between the navy-blue seawater and the tangerine-tinted sky. If I could only use one word to describe Herald: fluid. The controls are very easy to use and, whether you walk around and explore the ship or converse with an NPC, gameplay is smooth. Everything flows smoothly and the game feels like a complete experience, instead of just fragmented snippets that don’t really mesh. My playthrough of the first half, or Book 1, of Herald (The second half, or Book 2, will release as DLC) lasted around five hours: impressive for the point & click genre, all the more so considering the production quality and effort put into Herald. I never felt that the gameplay was padded out with filler dialogue or pointless side quests; each character, task, and interaction was integral to the development and appreciation of Devan's journey. Most point & click titles have two hours (give or take) of gameplay, so Herald having a total of ten or so hours (with its upcoming DLC) should be acknowledged. Herald is a delight to play. It has a cast of complex, interesting, and incredibly voiced characters, beautifully captivating art design, and a fresh and fun story that will leave you wanting more.